When designing or repairing a hydraulic system, part of the challenge is making sure all the components work together properly. This can be difficult, especially when you are using a mix of old and new components or components from different manufacturers. If you want to ensure perfect compatibility among some of your most vital parts, simply get Oilgear hydraulic power units in Wilmington CA. These components have been specifically configured to work together to deliver optimum control, efficiency, and reliability. And don’t forget that maintenance gets much easier when you have Oilgear hydraulic power units in Wilmington CA. All you have to do is pop the unit out for service which is easier than disconnecting all kinds of separate parts to get at the one that needs attention. Need To Customize Your Hydraulic Power Units in Wilmington CA? To ensure you get the correct capacity from your Oilgear hydraulic power units in Wilmington CA and meet various system requirements, adjustment or outright customization may be needed. Fortunately Oilgear is known for its flexibility and willingness to meet exact consumer specifications. 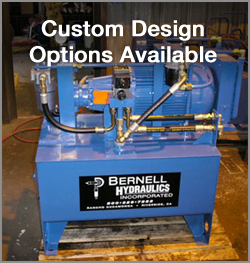 Bernell Hydraulics does a lot more than just order your parts for you. We also make sure your parts are living up to the manufacturer’s promises with expert hydraulic repair and maintenance services. When you buy your Oilgear hydraulic power units in Wilmington CA from us, we can offer convenient onsite delivery and installation. You can also count on us for fluid flushes, filter changes, and repairs down the line.